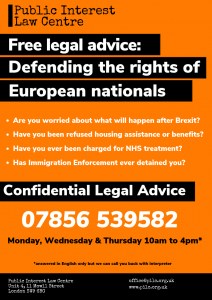 New leaflet – defending the rights of EEA nationals – 8th April 2019. 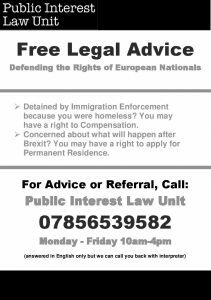 The Public Interest Law Centre took the Home Office to court in 2017 and ended operations that saw Immigration Enforcement arrest and deport European people who were sleeping rough. We have expanded our work to monitor and defend the rights of European nationals who are homeless, at risk of homelessness or vulnerably housed. Funding the legal challenge – Elephant and Castle – 24th March 2019. 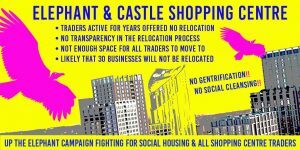 A coalition of local people and groups are fighting for fairer regeneration at the Elephant and Castle – a regeneration that was supposed to deliver jobs and homes for local people, but is doing the exact opposite. The Public Interest Law Centre is instructed in this case and has filed an application for permission to proceed to a Judicial Review. The regeneration has already lost over a thousand council homes, from the Elephant’s demolished Heygate estate, a scandal in a borough with desperate housing need. Now, shopping centre owner and property developer Delancey has won permission to demolish the local shopping centre. They also have permission to build new shops and nearly a thousand homes, but only 116, at best, will be social rented – and we will have to wait nearly ten years to get them. Southwark’s Council’s planning committee was misled as to the maximum amount of affordable housing the scheme could viably provide. While Delancey said it could only afford to provide 116 social rented units we now know that with Mayor’s funding they could give us another 42. That’s 42 families deprived of somewhere decent and affordable to live. Jerry Flynn our client is challenging Delancey’s planning permission through a Judicial Review. We want the permission quashed and then a development scheme that provides homes and shops that are truly affordable for local working class people. Please donate to our appeal, any amount big or small! Please share this page with you friends and contacts! Any donation you can make will help in this crucial fight to make London a city where the needs of our diverse communities come before the profits of offshore property developers. Baring Foundation Grant – 17th March 2019. We are pleased to announce that the Baring Foundation through their Strengthening Civil Society programme has awarded eight new grants, one of which has been awarded to the Public Interest Law Centre. The funding round is intended to support the work of expert legal organisations, who work or want to develop further as ‘hubs’ for legal action. Along with seven other organisations we will be provided with £100,000 over a three year period to develop our strategic litigation to assist victims of domestic violence. Our work intends to defend, enforce and promote the housing rights of Domestic Violence survivors through free legal representation, capacity-strengthening of the voluntary sector and strategic litigation. In total eighty two expressions of interest were received by the Baring Foundation, and so we are thrilled to be an organisation acknowledged for our work in this field, and recognising our joint work with Solace Women’s Aid. One step back, hopefully two steps forward. On Friday 1st March 2019 the Chief Magistrate of England and Wales, ruled that Brigadier Priyanka Fernando, a former Sri Lankan Defence Attaché, will face a retrial on 7th May 2019. On 4th February 2018 Brigadier Fernando was filmed, whilst on duty in his military uniform, making a number of cut throat gestures to the peaceful protestors who were situated opposite the Sri Lankan High Commission. The protest had been called by Tamil Solidarity. Three protesters instructed the Public Interest Law Centre through the International Centre for Prevention and Prosecution of Genocide (ICPPG). On 1st February 2019 and later the 1st March 2019 arguments were heard that Brigadier Fernando actions were covered by indefinite immunity. The argument being they were within his ‘official duties’ to monitor anti-Sri Lankan activities and report them to the Sri Lankan High Commission. In reliance of this the Defence supplied to the Court his job description. That provides the Brigadier was officially authorised by the Sri Lankan Government to “Monitor any anti-Sri Lankan activities in the UK and report to the High Commissioner and through her to the Intelligent Agencies in Sri Lanka” – therefore any actions taken – presumably slit throat gestures were also authorised. This argument was rejected by the Chief Magistrate. The Defence then made an application under s.142 of the Magistrates’ Court Act to have the conviction set aside. The case was adjourned to 15th March 2019 to deal with that application. At the hearing on 15th March 2019, the Defence argued that there had been procedural mistakes in this case which meant that the conviction was invalid. The Chief Magistrate agreed. That was largely on the mistakes made by the Court in its failure to disclose a letter from the Sri Lankan government to the private prosecutors and presumably the Defence. As a result the conviction was quashed. A retrial will be held at 2pm, 7th May 2019 at Westminster Magistrates Court. 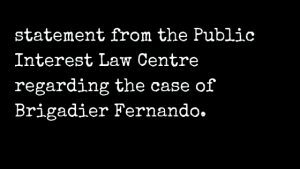 On 21st January 2019 Brigadier Fernando was convicted in his absence and a arrest warrant was issued. The offences of which he was convicted were serious examples of their kind, and committed on the streets of London. On 1st February 2019 the Chief Magistrate asked for the a hearing having withdrawn the arrest warrant. The purpose of the hearing was to consider whether Brigadier Fernando benefited from diplomatic immunity. It is our view that the Brigadier no longer enjoys diplomatic immunity for actions committed in his private capacity having left his post further to article 39(2) of the Vienna Convention. The Brigadier and his legal team did not appear at hearings on the 13 March 2018, 8 August 2018, 9 November 2018 or 21 January 2019. However a legal team has now been engaged by the Brigadier and they were at court on the 1st February 2019. The Public Interest Law Centre along with our counsel agreed with the Court that the matter of diplomatic immunity should be argued at a full hearing on the 1st March 2019. This will allow the Brigadiers legal team to present further legal submissions to the Court. Recent press coverage of the case can be read here in the Morning Star and the Guardian. 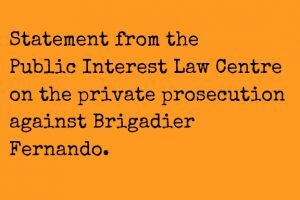 The Public Interest Law Centre acts for Mr Majuran Sathananthan in this private prosecution against Andige Priyanda Indunil Fernando (‘Brigadier Fernando’). The defendant, Mr. Andige Priyanka Indunil Fernando, [referred to throughout as ‘the Defendant’] is a Sri Lankan military official who, in the past, has carried out military operations during the civil war in Sri Lanka.He was found guilty by Westminster Magistrates’ Court of offences under s.4A and s.5 Public Order Act 1986 on Monday 21 January 2019. In 2017, Brigadier Fernando was posted to the United Kingdom as the Sri Lankan High Commission’s Minister Counsellor (Defence).On the 4thFebruary 2018, protestors (including the victims) went to the Sri Lankan Embassy in London, to protest against the Sri Lankan Government and their treatment of Tamils. The Defendant with other Embassy and Consular staff had gathered to celebrate Sri Lankan Independence Day. The Defendant initially came outside the embassy and started filming the protestors using his mobile phone before returning to the Embassy. He then made ‘cut throat’ gestures towards the protestors. He repeatedly ran his forefinger across his throat while looking at the protestors causing them fear, alarm and distress. The video of him, in full military dress uniform, making the threat in front of the Sri Lankan High Commission went viral. An information was laid on 6 February 2018 and a summons issued by Westminster Magistrates Court on 22 February 2018. The summons were first served on 7 March 2018 to the Sri Lankan High Commission and to his home address in the UK; a fresh summons and the complete bundle of prosecution documents were served on 28 October 2018 to the Ministry of Defence and the Brigadier’s home address in Sri Lanka via an international process server. Following a Court order granting permission to serve documents through facebook, the summons and bundle were served directly to the Defendant through his personal Facebook account, and also by registered post. At the trial listing on Monday, 21 January 2019, the Prosecution applied to proceed in the Defendant’s absence because he had failed to appear. The Court were satisfied that he had been given due notice and proceeded to hear evidence from Majuran Sathananthan, Golulakrishnan Narayanasamy, Palliya Guruge Vinoth Priyantha Perera, Sockalingam Yogalingam and Sabeshraj Sathiyamoorthy. The Bench then found the Defendant guilty of s.4A and s.5 PO Act 1986 offences. The Magistrates issued a warrant for Brigadier Fernando’s arrest after finding him guilty of the charges so that he could be produced for sentencing if he were to return to the UK. Following the trial, Public Interest Law Centre was contacted by Westminster Magistrates’ Court and was informed that the arrest warrant had been withdrawn and the matter relisted on 1 February 2019. The Court did not relist the matter before withdrawing the arrest warrant. The Court asked the UK Foreign and Commonwealth Office (FCO) to confirm whether the Brigadier enjoys immunity from prosecution. After the 21stJanuary 2019 hearing, it has come to our attention, that the Sri Lankan Government acknowledged the proceedings in November 2018 and elected not to participate in the proceedings. A Sri Lankan Foreign Ministry spokesman, Saroja Sirisena, has also said publicly that the Sri Lankan Government had made submissions to the UK Foreign and Commonwealth Office (FCO) objecting to the ruling of the court. According to Mr Sirisena, the FCO then contacted the Westminster Magistrates Court regarding those objections. It is unclear on what basis the FCO has sought to intervene in the judicial process. In our view the trial was heard on 21 January 2019 and proceedings concluded. It appears that the Brigadier Fernando and the Sri Lankan Government had sought to frustrate proceedings by electing not to participate in the hearing. As this has proven ineffective, the Sri Lankan Government are attempting to retrospectively make arguments that could have been made if a representative appeared before the Court on 21 January 2019 or well in advance. Even if the Defendant had attempted to invoke immunity at the Trial, in our view he would not have been successful. Immunity cannot be invoked in order to defend a diplomat from all unlawful acts indefinitely. It is our view that Brigadier Fernando does not have the protection of diplomatic immunity for the following reasons. This is incorporated into UK law in the Diplomatic Privileges Act 1964. It provides that immunity ends a reasonable time after the diplomat leaves their post (CPS practice provides for 31 days). Immunity will onlybe maintained thereafter for any activities he carried out inthecourseofhisofficialduties. This is not unusual and proceedings have been successfully brought in the past against ex-diplomats. Immediately after the threats made by Brigadier Fernando – the Sri Lankan Government not only stripped him of his position (and therefore, we argue, of his immunity) but they also sent him back to Sri Lanka.Brigadier Fernando is no longer listed on the 2019 London Diplomat List and therefore is no longer a diplomat in the UK.He no longer comes under the protection of Article 31 of the Vienna Convention in respect of proceedings in England and Wales. ‘Authorities in Sri Lanka have taken serious note of videos being circulated on social and web-based media of an alleged incident involving the Minister counsellor (Defence) attached to the Sri Lanka High Commission in London behaving in an offensive manner. Recent statements by the Sri Lankan Government spokesperson questioning the jurisdiction of the Court are at odds with the earlier commitment to deal with this serious incident. The Supreme Court held that diplomatic immunity ended when the Diplomat left their post and they could no longer enjoy immunity in an employment tribunal. Reyes and another v Al-Malki and another  UKSC 61; The House of Lords considered the reasoning behind the end to diplomatic immunity in R v Bow Street Metropolitan Stipendiary Magistrate, ex p Pinochet Ugarte (No 3)  1 AC 147, sub nom R v Bow Street Metropolitan Stipendiary Magistrate, ex p Pinochet Ugarte (Amnesty International intervening) (No 3)  2 All ER 97, HL; and para 253. 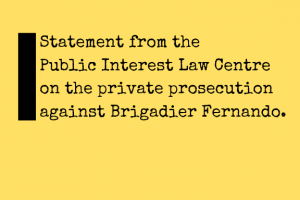 Brigadier Fernando found guilty of breaching Public Order Act – warrant for arrest issued – 22nd January 2019. Brigadier Fernando – still smiling? 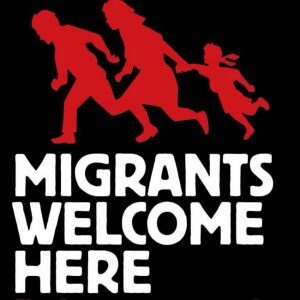 On Monday 22nd January 2019 ‘Brigadier Fernando’, a high-ranking Sri Lankan military official, was been found guilty of using threatening behaviour towards Tamil protesters outside the Sri Lankan embassy in London last February. The Judge, at Westminster’s Magistrates Court, issued a warrant for Mr Fernando’s arrest. If he returns to the UK he is likely to be arrested on arrival as the police have now been made aware of the warrant. 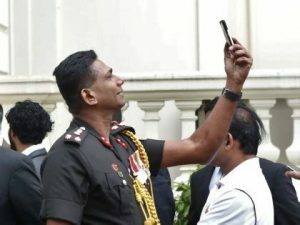 Mr Andige Priyanka Induni Fernando, otherwise known as ‘Brigadier Fernando’ was taken to court following the emergence of a video taken during the country’s Independence Day celebrations in London. In the video, Mr Fernando is seen repeatedly running his forefinger across his throat whilst maintaining eye contact with the protestors. Protestors who were present outside the Sri Lankan embassy last February, and who were the targets of Mr Fernando’s threats, were represented today by lawyers at the Public Interest Law Centre. Mr Fernando was found guilty under Section 4A and Section 5 of the Public Order Act 1986. The protestors claimed that Mr. Fernando’s behaviour had been threatening and intended to cause harassment and alarm to the protestors. The Sri Lankan government currently stands accused of war crimes against Tamil detainees, including summary execution by throat-slitting. Mr. Fernando, standing outside the Sri Lankan High Commission, appeared in full military dress whilst making the gestures. PILC will be seeking clarification from the Foreign Office that they will take steps to contact the Sri Lankan government for the Brigadier to be returned to the UK. running his fingers across his throat, at a public event, in order to threaten Tamil protestors. He will be prosecuted under the Public Order Act 1986, for using threatening behaviour and visible representations whereby the victim is likely to believe that such violence will be used. In early 2018 protestors were gathered outside the Sri Lankan Embassy in London, protesting against the treatment of Tamils by the Sir Lankan Government. Embassy and Consular staff had gathered to celebrate Sri Lankan Independence Day. Brigadier Fernando was attending the celebrations. Brigadier Fernando filmed protestors from outside the embassy before returning inside. He returned and made gestures towards the protestors, repeatedly running his forefinger across his throat whilst maintaining eye contact with the protestors. The video of him, in full military dress uniform, doing this in front of the High Commission went viral. The Public Interest Law Centre will take the case to Westminster Magistrates Court on 21 January 2019 on behalf of their clients who were attending the protests. Brigadier Fernando had looked directly at them whilst making the threatening gestures – after videoing them – causing them to fear the threats would be carried out against them. The private prosecutors will rely upon the statements of witnesses present at the scene and upon a video recording which captures the behaviour of the defendant, who can be clearly seen to imitate the slitting of the throat. This was clearly directed towards PILC’s clients and other protestors present at the scene and was intended to cause them fear of violence, alarm or distress. The Public Interest Law Centre has sought a judicial review of the Home Office’s inadequate Schedule 10 policy. Those with withdrawn asylum claims (among many others) fall between the cracks of available support under Section 4 or Section 95 and have been failed by the lack of policy or application procedure for accommodation under Sch 10. This has resulted in prolonged destitution for those people who have been unable to apply for the support to which they are entitled. Today in the High Court we secured interim accommodation and support relief for our client who is homeless until such time as his further submissions or the judicial review has been determined, whichever is earlier. The Haldane Society of Socialist Lawyers for their debut episode podcast considered a leading case from the Public Interest Law Centre. Episode 1: Deported for Sleeping Rough considers the Home Office’s unlawful policy of arresting rough sleeping EEA nationals, stealing their identity papers, and then either detaining and deporting them, or releasing them back onto the streets without papers so that they cannot obtain housing or employment. The policy itself was declared unlawful in the case of R (on the application of Gureckis, Cielecki, and Perlinski) v Secretary of State for the Home Department, a case brought by Haldane Society members, and led by the Public Interest Law Centre. Its repercussions are still being felt, with homeless charities – St Mungo’s, Thamesreach, and Change Grow Live – who helped the Home Office implement their unlawful policies, now under investigation for data protection breaches. In addition, dozens of cases are being brought against the Home Office in order to pursue compensation for those who were detained and deported. 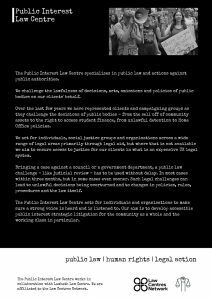 New Public Interest Law Centre leaflet – 15th November 2018. So, the new leaflet is nearly ready to go. 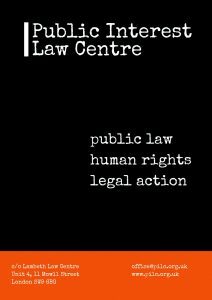 Coming in December 2018, ready for the new year as part of the launch of the new name – the Public Interest Law Centre. We are happy to announce that in the new year we will be changing our name to the Public Interest Law Centre. Our change of name reflects the fact that we are developing from a small public law unit to a Law Centre with a large caseload alongside a range of projects, and have been able to grow our team and take on new and exciting challenges. We will remain an integral part of Lambeth Law Centre and support its work as they support ours. We will continue to work primarily in public law, whilst also bringing actions against public authorities. In the next period we hope to continue developing quality legal casework and cutting edge strategic litigation but always with a commitment to support campaigns and social justice activists. We have made small but significant steps and we hope in the years to come they will become giant strides as we develop accessible, public interest strategic litigation for the community as a whole and the working class in particular. Our twitter account and website address will also change over the next period. Our web address to www.pilc.org.uk – and our twitter account will change from @_PILUNIT. “Further to a successful legal challenge by the Public Interest Law Unit (PILU) and Housing Action Southwark and Lambeth (HASL), it has become apparent that Southwark Council have been incorrectly applying the ‘space standard’ test for statutory overcrowding as contained in s.326 of the Housing Act 1985. Had Southwark applied the law correctly, it would have been recognised that the family in question were living in statutorily overcrowded conditions, and that in accordance with their allocation scheme they should have been placed in Band 1 and given an additional ‘Priority Star’ to reflect that status. The evidence provided by HASL and as a result of a Freedom of Information Request suggests that the error in fact forms part of a wider unlawful practice. Since December 2017, HASL have come across five cases where households have reported to Southwark that they are overcrowded according to the space standard for the number of people in the property and the number of rooms, that in each of these cases Southwark has proceeded to measure the size of the rooms and that in only one of the cases has the household been placed in Band 1 on Southwark’s allocation scheme. The Council’s response to a Freedom of Information request showed that since February 2018, 46 banding decision had been made which had involved assessing whether a household was statutorily overcrowded, all of these cases had been assessed with reference to the space standard set out in s326 Housing Act 1985, and all had been assessed solely with reference to floor area as opposed to the number of rooms. 13 of those cases had been found not to be statutorily overcrowded. Southwark Council have now admitted that the test for statutory overcrowding had been incorrectly applied the case in question, and while the Council have been reviewing previous decisions made on this basis, it is unclear whether everybody affected will notified and awarded the additional priority that they are entitled to. 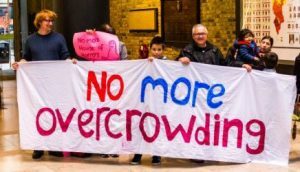 Southwark Council has formally adopted the measure of overcrowding contained in Part 10 of the Housing Act 1985 within its allocation scheme and is required to properly apply this when allocating social housing. A failure to do so is a breach of the Housing Act and amounts to an unlawful failure to follow a published policy. Southwark have been erroneously applying the space standard contained in s326(3) Housing Act 1985, by assessing overcrowding solely with reference to floor area and not also with reference to the number of rooms, as required. The error in our client’s case is material. Had Southwark correctly applied the space standard, his household would have been deemed statutorily overcrowded months ago, they would have been placed in Band 1 of the allocation scheme and awarded an additional priority star. This was also not an isolated error on the part of the Council. The evidence we have obtained from HASL and as a result of our Freedom of Information Request shows that Southwark have been consistently misapplying the law in every case. It is therefore likely that many households have wrongly been assessed as not being statutorily overcrowded and placed in the incorrect housing Band. We know that there may have been as many as 13 cases since February 2018 which must now be reviewed, but we are unclear as to how many households may have been affected before this date. We will be seeking assurances from the Council that they will review all relevant cases, but if anyone thinks they may have been affected, please contact HASL and/or seek legal advice. Overcrowded housing in the private rented sector, but also in Southwark’s own council housing, is one of the main problems we come across in our group and is one of the more invisible sides of the housing crisis. We know many families forced to live in single rooms, studio flats and one bed flats because of discrimination and extortionate rents in the private rented sector. We know first hand the devastating impact that overcrowded housing has on people’s lives particularly their mental and physical health. We have been raising the problem of overcrowding with Southwark council for years but the council have failed to engage and take meaningful action. 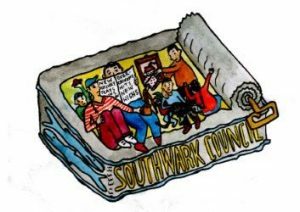 Southwark council should be supporting their residents to access their housing rights and the secure council homes they need, instead it took a legal challenge before the council would accept that it had been wrongly denying that our families were statutorily overcrowded. Together with PILU, we will be making sure that the council goes back to review all previous decisions and applies the law correctly for all future cases. Save Southall Town Hall campaign – victory – 20th July 2018. 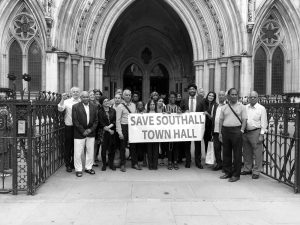 Friday 20th July 2018 was a big day for our client and the Save Southall Town Hall campaign. In the Royal Courts of Judge Martin McKenna ruled that the London Borough of Ealing had acted unlawfully in the way it sought to dispose of a community asset. Judge Martin McKenna took under 40 minutes to summarise arguments presented by both sides and deliver his verdict. He did NOT believe the arguments presented by Ealing Council or the scant evidence provided by them. In agreeing with our submissions he stated that a sale cannot simply be conducted where the interests and the needs of the community are at stake, rather consideration must be had to whether to sell buildings for less than the highest price where, as in this case, the community are involved. The Ealing cabinet had failed in its legal duties to do this. He was also very critical of the equalities impact assessment that Ealing council and held that they had failed in their duties on this. This decision is significant and it places councils on notice that they must have in mind working class communities and their community assets before rushing to sell to the highest bidder. It is certainly something that in future cases anti-austerity campaigners may find useful. Make no mistake this ruling and important legal decision would not have been possible without the marvellous campaign waged by the people of Southall. In fighting the fire-sales that local authorities intend to make over the next period this decision will be an asset in countering those plans. Judge Martin McKenna quashed Ealing Council Cabinet decision to sell Southall Town Hall. Ealing Council can appeal against the decision within 21 days but have little grounds for doing so, as they presented little or no relevant evidence at the hearing. Their barrister was unable to respond to the Judge, as he had no one from Ealing Council to instruct him on the matter. Helen Mowatt and Paul Heron, lawyers from the Public Interest Law Unit were instructed in this case. What is the Undercover Policing Inquiry? In March 2015, Theresa May announced a Public Inquiry into undercover policing. This announcement followed revelations that undercover political policing was systematically used from 1968 to date, to spy on political campaigners. Scandalously the undercover officers often used the name of dead children to create their false identities. These undercover political police operations were part of of the ‘National Public Order Intelligence Unit’ (NPOIU) and/or the Metropolitan Police Service’s ‘Special Demonstration Squad’ (SDS). They deceived women into long-term intimate relationships and fathered children with them. They also befriended grieving families involved in seeking justice and have acted as agents provocateurs. The undercover political police operations under scrutiny by the Inquiry are limited to those conducted in England and Wales. This is despite the fact that much evidence has come to light demonstrating that undercover political policing operated in Scotland. For all activists who may have been spied on in Scotland, the nature and extent of the undercover political policing falls outside the Inquiry’s remit which is limited to England and Wales. There is no Scottish inquiry. In September 2017, Edinburgh’s Court of Session the Public Interest Law Unit was granted permission on behalf of our client Tilly Gifford to proceed with a full Judicial Review – that is now due to take place on Thursday and Friday. Tilly Gifford, an environmental justice campaigner and member of Plane Stupid, had been targeted by undercover officers in Scotland. In 2009, officers had attempted to recruit her as an informant. Referred to as an on-going “business arrangement”, Tilly was asked to betray her friends, beliefs and the communities in Scotland that she had been campaigning to protect. In the course of three meetings, police officers had indicated that they would give Tilly cash payments in exchange for information, and threatened her with prison should she fail to cooperate. Tilly recorded these exchanges and exposed the Police and their tactics in the media. The identities of these officers remain unknown, and it is unclear who had made the decision to target Tilly and on what basis. As is the case for all activists who may have been spied on in Scotland, the answers to these questions fall outside the Inquiry’s remit which is limited to England and Wales. That is why this Judicial Review is so important. Is it right for the Scottish government to fail to call its own public inquiry into undercover policing north of the border? We submit that the UK government must extend the UCPI into Scotland, or the Scottish government must order its own public inquiry into how political policing operated north of the border. It’s now known there were at least 18 UK undercover active during the 2005 G8 Summit at Gleneagles. We know notorious undercover Mark Kennedy was active in Scotland, including maintaining relationships with those he’d targeted. Carlo Neri a SDS undercover, came to family events of the Scottish woman he had deceived into a relationship. The full hearing is due to be heard on the 19-20th July 2018. The Public Interest Law Unit is bringing a case against the UK and Scottish government on behalf of our client Tilly Gifford. The Judicial Review action is due to take place on the 19th and 20th July 2018 at the Court of Session in Edinburgh. 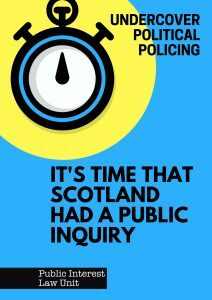 Working closely with Scottish lawyers we seek to obtain judgment that quashes the decison by the UK government for its failure to extend the Undercover Policing Inquiry (UCPI) north of the border; and/or the Scottish government failure to call its own inquiry into undercover political policing. On the back of that we supported the conference to support the Judicial review challenge. 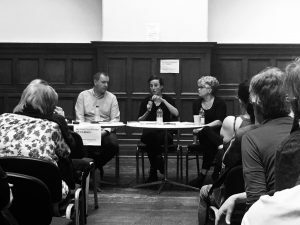 However, we see that the organising of the Scottish Campaign Opposing Police Surveillance (SCOPS) as a major break through in organising activists through the movement around the issue of police surveillance. The Undercover Policing Inquiry (UCPI) is at a crossroads – these are the words of Sir John Mitting – the Chairman of the Inquiry. On one level he is right, however as many Core Participants to the UCPI note, this is something he has caused. As a result a number of Core Participants have come together to launch a Judicial Review. They need to raise £5,000 to cover the initial stages of the application. The challenge is centrally against the refusal to appoint a diverse panel to look at the issues of systematic institutionalised racism and sexism, and the invasion of human rights particularly of working class campaigners for social justice. Can you help? Core Participants want to properly participate in this Inquiry. They want it to succeed. They want it to be transparent and fair. They feel that there is no option but to issue a legal challenge now. An article about the issues involved can be found in the the Guardian from Rob Evans. The challenge is supported by lawyers at Public Interest Law Unit and is being brought by Birnberg Peirce solicitors. Following the successful case of Gureckis the Public Interest L aw Unit has launched a free telephone advice and referral line. The phone line will be open Monday-Friday (10am-4pm). We are open for direct and second-tier advice as well as referrals. 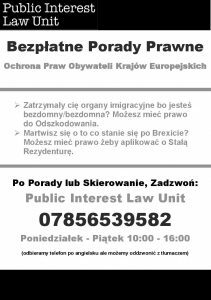 Attached ready-to-print are flyers in English and Polish (other languages to follow). Referrals can also be made by emailing office@pilu.org.uk . We will work with all EEA nationals affected by homelessness or at risk – this means we can work with those vulnerably housed, moving from place to place as well as those sleeping rough. The remit of our work focuses on challenging unlawful public bodies’ decisions, actions or policies in a range of arrears – may it be access to Welfare Benefits, Healthcare or Housing. We are also aware of continued enforcement and discrimination against EEA nationals, which we will challenge wherever possible. Please do not hesitate to call or email us to discuss any recurrent issues you encounter in your work or potential referrals. 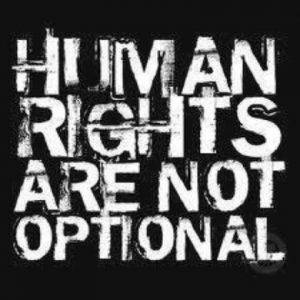 learn, defend and enforce their rights. The Public Interest Law Unit will take a strategic litigation approach to challenging central government, local councils and the Greater London Authority’s policies and practice where those are judged to infringe homeless people’s rights. Learnings will also be shared to support front line organisations and ensure the impact of test cases is promoted and to maximise the impact of the project across the sector. The project will benefit EEA nationals who are homeless (sleeping rough, sofa surfing, vulnerably housed) or at risk of homelessness as well as those supporting them through frontline advice and casework. Training on the opportunities and limitations of Public Law as a tool for defending the rights of homeless people. Implementation of the Homelessness Reduction Act. Lawyers from the Public Interest Law Unit attended the launch of SCOPS yesterday. The day was a great success with speakers from a whole range of different traditions uniting together to launch a united campaign for a public inquiry into undercover political policing in Scotland. 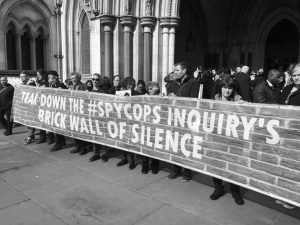 It is becoming increasingly clear that many undercover officers – part of the SDS and the NPOIU – were involved in spying on Scottish social justice campaigners. 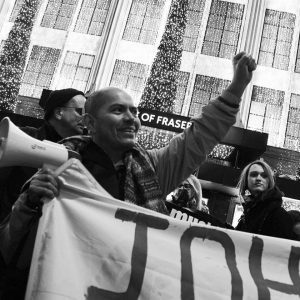 Those campaigners encompass the whole spectrum of progressive activists from trade unionists, socialists, environmental campaigners, and community activists. The Conference kicked off with speeches from Neil Findlay MSP who has been in the forefront of raising the cases of blacklisted workers. Eveline Lubbers from the Undercover Research Group spoke in broad terms about the work she does in researching and uncovering police spies. Finally Tilly Gifford a social justice campaigner – explained her reasons for bringing a judicial review against the UK and Scottish governments for failing to organise a public inquiry into undercover political policing north of the border. ‘Andrea’ from Police Spies Out of Lives spoke powerfully about how she was deceived into a long term relationship with an undercover police officer who used her to legitimise his spying on socialist activists she campaigned with. The afternoon session heard from a range of speakers including Pat Egan from the National Union of Mineworkers. He spoke about the recent grant of a judicial inquiry into policing during the miners strike 1984-85. Dave Semple from the PCS (civil service union) spoke about interference by the security services in his union in the 1980’s, and the ongoing battles against the bosses today. Paul McGloughlin spoke from the Miscarriages of Justice Orgnisation (MOJO) about their support from the public inquiry being extended to Scotland. In September 2017, Edinburgh’s Court of Session agreed to grant permission for a full Judicial Review hearing to take place. The case brought by the Public Interest Law Unit on behalf of Tilly Gifford, a social justice activist, is important. The full hearing is due to be heard on the 19-20th July 2018. However, notwithstanding the legal case, we must build a campaign to force the UK government and the Scottish government to concede to a proper inquiry. Truth and justice are demanded by trade unionists, environmentalists, women activists, blacklisted workers, and social justice campaigners. After a long delay and a brilliant response by Members of Parliament, Fernando Gonzalez Llort has finally received his visa for entry clearance to Britain. He is now arriving on 13th June to speak to MPs, the Cuba Solidarity Campaign AGM, the RMT Garden Party, UNISON National Delegate Conference and trade unionists across the country. Fernando made his visa application on 16th April 2018 but a month later he was told that his application needed ‘additional processing’. 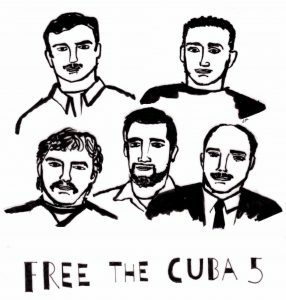 Three years ago, Gerardo Hernandez and Rene Gonzalez, two other members of the Miami Five, had their visas refused on three occasions before a lengthy legal challenge and far reaching campaign finally secured their entry. This time we had serious concerns as the wait went on for Fernando’s visa and there was no update from the Home Office. In just the past three days over 20 Members of Parliament contacted the Home Office and the FCO raising these concerns. This rapid response illustrates the breadth of support there is in parliament for the Five and for Fernando’s visit next week. Solicitors then issued a pre action protocol letter for judicial review to the Home Secretary Sajid Javid MP making it clear that further delay would be deemed as ‘a clear violation of the Article 10 Rights of MPs to receive and impart information‘ which was the basis of the legal victory in November 2015. Paul Heron, solicitor said “We are delighted that we could support Fernando in securing a visa to visit colleagues and MPs in the coming weeks. It is just a shame that the UKVI had thrown this historic visit into jeopardy by looking to refuse access to the UK”. Once again we have been forced to take action to secure a visa for a Cuban visitor to the UK. We would urge the Government to do all it can to facilitate exchange, trade and understanding between UK and Cuba at a time when the Trump administration seems intent on reverting back to a ‘Cold war’ failed policy of Blockade and intervention.